I am frequently asked this question by both prospective patients and health care providers. The bottom line is that there is little pain in receiving an acupuncture treatment. Due to acupuncture’s uniqueness it is understandable that some anxiety is to be expected . After all the idea of someone sticking needles into you like the proverbially pin cushion is not very entertaining. The truth however is that acupuncture is both safe and effective and there is little pain involved. The needles used in acupuncture are often not much thicker than a human hair. They are also shaped differently than a hypodermic needle which is hollow and has a sharpened edge to cut the skin. Acupuncture needles by contrast are more like a pine needle. Strong, flexible and thin they take on the shape of a pine needle with a refined point. When they’re used in treatment the skin is more spread apart by the entry of the needle’s tip. Modern acupuncture needles are made out of stainless steel and come in various lengths and gauges. They are designed to be used once and then properly discarded. Occasionally patients will experience a dull ache around the base of the inserted needle or some minor tingling at the moment of insertion. Often it is similar to a weak electric shock from a 9-volt battery. Distal points at the end of the extremities such as the hands or feet can sometimes be a little sharp but the sensation is usually brief. From time to time a needle may come in contact with a small nerve of a blood vessel and this can cause the momentary short term ouch which is to be expected. 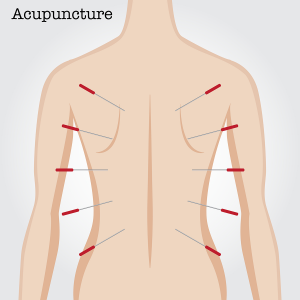 A typical treatment runs about a hour in length and uses between 15-20 acupuncture needles. Insofar as it is an ancient art there is no artificial intelligence involved with the treatment. Healing is as much an art as it is a science and depends both on a practitioner’s skill and experience. Often it’s good to sit down with the practitioner ahead of time to go over your treatment plan. Part of the getting acquainted process is to try a needle or two before the treatment to get an idea of what you’re getting yourself into. In a sense it’s a little like trying peanut butter pie for the first time. You can describe salivary experience all day but sooner or later you just have to try it. For more information on acupuncture, costs and how it can affect you click here.